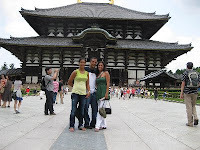 I took tourists from Florida to Nara. 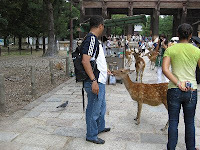 It was a one-day tour to Nara and Uji. After meeting at JR staion in Kyoto, we took a rapid train to Nara. At first, we visited Kasuga shrine. This shrine has a lot of lanterns made of metals or stones. Walking along the path to the shrine with lanterns on both sides is very impressive. Here and there, you can run across deer, most of which are very quiet and seem to be relaxed. The path from the shrine to Nigatu-do hall is very peaceful. I like this path. 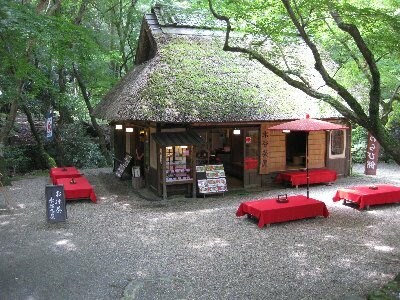 On the way to the hall, there is a very cute cafe serving Japanese sweets. 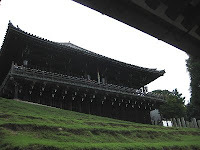 The floor of Nigatsu-do hall is high, and we could command the view of Nara. Nigatsu means February, and "dou" means a hall. 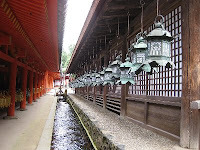 In every February in the lunar calender, a big Buddhism rite took place in this hall called "OMIZUTORI"
Omizutori ,which means taking sacred water, has been held as an annual rite for about 1450 years without stopping. As we see on the TV news, Big torches are carried up to Nigatsu-do hall at night. And then we walked to the main hall of Todaiji temple. 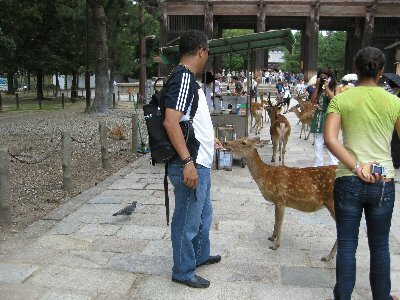 After getting out of the gate, they bought some deer crackers to feed deer. At that time, the incident happened! a greedy deer came to a woman of our tour, and ask her to give him? some crackers( maybe ). She didn't notice him(?) and then, he pulled her clothes very strongly.. took her clothes,,,,,,,,,,,,,,,, a bit, mmm a little more ,,,, anyway the incident was over with her scream. It would be an unforgettable memory for them in a good? or bad ?way. We came back to Uji, and enjoyed the museum in the temple. And we visited the oldest tea shop in Uji. Happenly, the shop owner showed us around in the shop. It was very impressive. I got to know that we can have a tea (for tea-ceremony)-making here. Some foreign students work at this shop, too. The youngest girl of our group made friends with a shop clerk and promised to get contact with each other through facebook! I really loved the post because it's fun and that's what i needed to rise my energy, if you are insterested in a luxury travel click in our web, thanks! !